Spend $500 or more and as a Thank You from Wholesale Salon Equipment, you will receive a Complementary 3 Night Luxurious Resort Vacation... You have a choice of 7 locations. 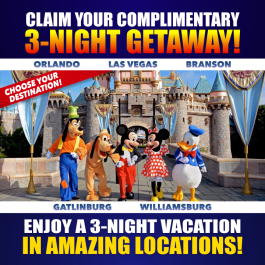 Branson * Daytona Beach * Gatlinburg * Las Vegas * Myrtle Beach * Orlando * or Williamsburg. ***At time of activation you are required to pay $19.70 per night taxes and fees. ***You do pay for your own transportation.